If you had to choose three (and only three!) things you’ve ever sewn to best represent what you can do, what would you choose? I’ve recently been tasked with exactly this, and I found it incredibly difficult to decide. I mean, it’d be difficult enough if I was confined to just one type of garment, like “Pick three dresses” or “Pick three casual garments”, etc, but just three, from the hundreds of garments I’ve sewn in the past nine years?! This required thought. Having said that, strangely, the first of my picks was pretty easy – my Winter Coat. 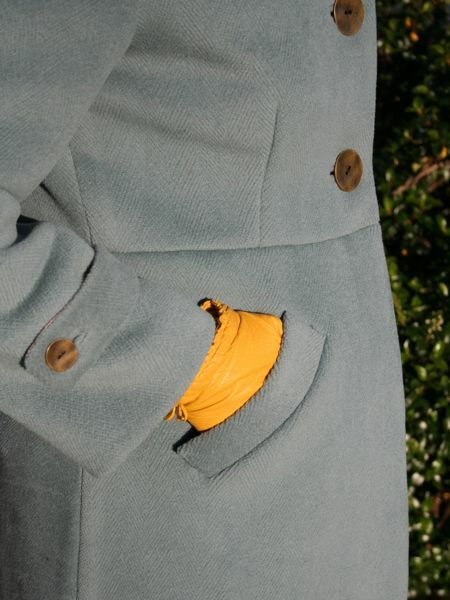 I made this coat two winters ago and I’m really, really proud of the finish on it. The wool is extremely thick, with bound buttonholes, metal buttons, single welt pockets, a thick silk lining, and (most proudly for me) I didn’t use a single bit of fusible anything in its construction. I wear it to death in winter and I love everything about it. Should I play my trump card and pick my vintage refashioned wedding gown? Well, alright then! 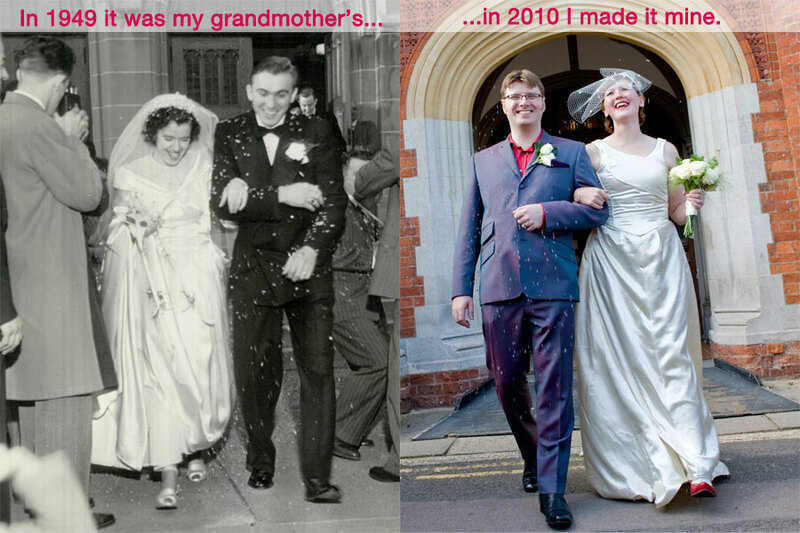 If you recall, I spent the majority of 2010 sewing both bridesmaid’s dresses in addition to muslining, adapting, redrafting, and scrutinising a Brazilian bodice pattern before carefully unpicking my grandmother’s silk wedding gown from 1949. It took two solid months and a behemoth amount of handstitching (using couture techniques wherever possible) before the dress was complete for our September wedding. I realise most women look back on their wedding gowns with fondness, but I’m still absolutely bursting with pride over what I accomplished with this gown. A friend came over at the weekend while it was home from its storage and it was great to see someone’s first reaction to the details and story all over again. The third pick was actually the hardest. Having chosen a coat and a formal dress, I didn’t want to pick another dress, or another jacket or coat, so maybe something casual. But knit tops or exercise gear don’t really look as impressive when examined – they look a bit too RTW. 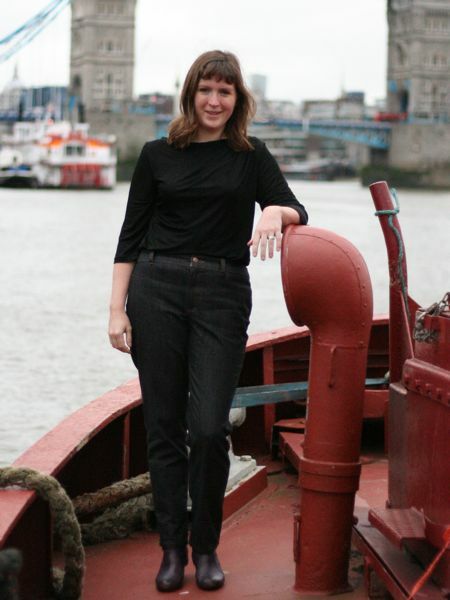 But jeans – the average person always seems ridiculously impressed when they discover I’d made the jeans I’m wearing! I’d pick my NY-Lon jeans, but to be honest, I’ve worn them so much over the past few years that the denim is fading in places even though the stitching is holding up just fine. Conversely, my Clover jeans don’t fit me nearly as well (way too baggy in the waist and hips now), but the construction details are much cleaner and just as impressive laid out. So I’ve picked my three garments, a coat, a wedding gown, and a pair of jeans. Sometimes we get so focused on the garment we’re working on at this moment, and then the next things we want to sew, that it takes a question like this to really make us stop and reflect. I know I certainly don’t think back on my “body of work” as a whole very often, usually only when encapsulating the past year’s work on New Year’s Day. If you had to pick three of your own garments like I did, what would you choose? Separator image Posted in Inspiration and tagged with coat, dress, jeans, reflections.